Microsoft’s Windows Template Studio 3.0 released! Microsoft yesterday released its version 3.0 of Windows Template Studio, which is its first major update since version 2.0 was released in April last year. 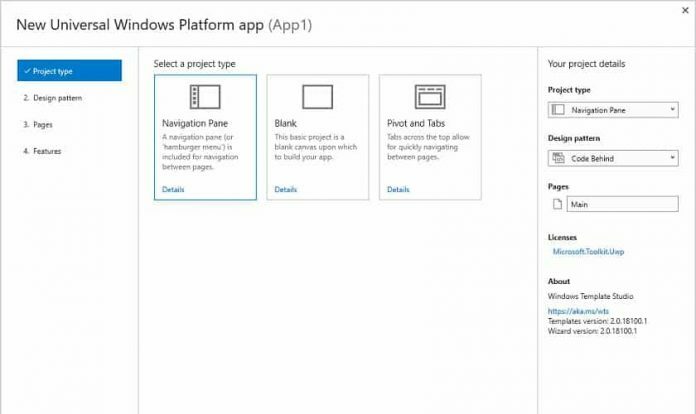 For those unaware, launched in 2017, Windows Template Studio is kind of replacement for the Windows App Studio and the company has been working continuously on improving it since its launch. Template Studio, an open-source project, makes it easier for developers to build full-fledged UWP (Universal Windows Platform) apps without writing a line of code. Code now generates as a multi-project solution. This will enable better reuse and separation of code logic. This now will output a UWP project and .NET Core project. Horizontal Navigation View has replaced the Pivot navigation pattern. Further, there are also known issues with the Windows Template Studio 3.0 that one must be aware of. One can experience issues while using this with Visual Studio 2019, as preview support for multi-project is showing a NuGet reference failure for the Core project. Also, Feedback Hub has been removed for now until a bug has been fixed in their SDK. Microsoft is also currently building on few things that it plans to include in future builds, such as Menubar navigation pattern template (ETA is v3.1), Identity Login (ETA is v3.1), Improved Visual Studio 2019 support, Azure features starting to be added in (v3.1 and beyond), and Unit Test projects.